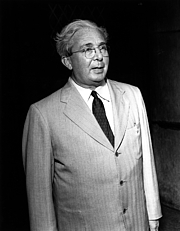 Physicist Leo Szilard circa 1960. DOE Digital Archive Image 2017774. Leo Szilard was born to a German-speaking Jewish family in Budapest, Hungary. His engineering studies at Palatine Joseph Technical University in Budapest were interrupted by service in the Austro-Hungarian Army during World War I. After the war, he decided to leave Hungary, where he thought he had no future due to rampant anti-Semitism and nationalism. In 1919, he enrolled at the Technische Hochschule in Berlin, but soon transferred to the University of Berlin to study physics. He studied with Albert Einstein, Max Plank and Max von Laue, among others, and received a doctorate in 1922. He taught physics and worked on several inventions, including a linear accelerator, electron microscope, and a cyclotron. In 1933, when the Nazi regime rose to power, he moved to London. There he conducted experiments on nuclear chain reactions and filed a patent on his process, which he later assigned to the British Admiralty. In 1938, he emigrated to the USA, settling in New York and teaching at Columbia University. Concerned about Nazi aggression in World War II, he drafted the letter that his friend Einstein sent to President Franklin D. Roosevelt urging the U.S. government to develop an atomic weapon before Germany did, and was assigned to work on the Manhattan Project set up to achieve this. With Enrico Fermi, he created the first controlled nuclear chain reaction in 1942. After the war, Dr. Szilard vigorously opposed the nuclear arms race, and advocated global cooperation. He switched his field of study to biology, and worked on the invention of the chemostat. In 1951, he married Gertrud Weiss, a German émigré physician he had known since before the war. With his friend Jonas Salk, he helped found the Salk Institute for Biological Studies in La Jolla, California. Among his numerous published works was a volume entitled The Voice of the Dolphins and Other Short Stories (1961). He is considered one of the most imaginative and original thinkers in 20th century physics. Leo Szilard is currently considered a "single author." If one or more works are by a distinct, homonymous authors, go ahead and split the author. Leo Szilard is composed of 4 names. You can examine and separate out names.